← What is pure Armenian folk music? 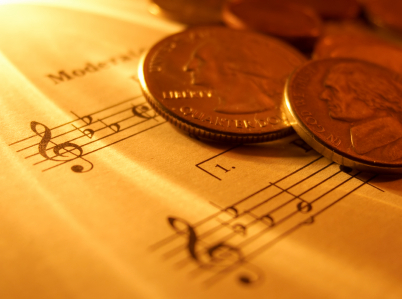 To play music for free or not free..that is the question! Well, it happened again today and I immediately thought the subject would make for a great blog discussion. You can be the judge. I was asked to play an event for free. This is certainly something every musician I know has been asked at least once. (In reality, its much more than that!) Artists of all kinds have similar stories about being asked to give their art away at no cost to the would-be buyer. I can recite numerous anecdotes and witty comebacks on how many artists respond to such requests. See the below Craigslist ad, it is pretty funny…but it gets you to think, right? In regards to this particular event, I refused the offer. Mainly because I was aware of the event and its draw and know that other artists were compensated for their work and I felt it wasn’t fair to ask me to play for free. Most musicians would agree with my decision. I have no remorse over it nor would I vilify the event because they didn’t wish to pay me. In the end, I think most people want to be able to pay an artist but may not have the financial means to do so. This example was not the case and I moved on. No harm, no foul. However, it did get me to think about when might a musician play for free. I am always interested in the philosophy of an artist when it comes to being compensated. Usually it can be a lively discussion among artists. My philosophy is fairly simple and certainly it is my opinion. I think as human beings we should all try to give back to the community we take from – in one shape or another – and either at one point in our lifetime. Some do so with actual money, some do with time, some also do with their art. To give with money is nice, certainly this is the most popular way to give and most that receive funding are very thankful. I do not have those kinds of funds to donate to worthy causes, but I do have my music and it can do some good, I have seen that. This is something I can contribute and whereas I enjoy music and I do not do this for financial means, it allows me the flexibility to give back to the community. My community is vast and can encompass my church, my city, etc. It can even be for another musician in need of help. I will donate my services more often than not when I know it is appreciated and truly needed. That doesn’t mean I must do so each time, but money isn’t the driving force to why I play and enjoy music. I am a firm believer that much comes from giving your time and art to others. You may not realize it, but it has an impact and some cases – can pay dividends. I am not talking about “paying it forward” and almost overused phrase. I am talking about how giving of yourself void of greed can be a positive turn for your art, something that no amount of money could create. A simple example I have is that many years ago a film producer contacted me because he found a CD of mine in his local record store. (Remember those!?) 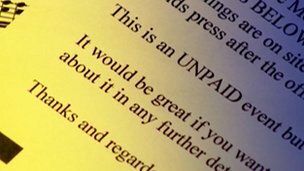 He was producing a documentary and wanted to use a few tracks of mine but didn’t have the money to pay me for the use. Other record producers/musicians turned him down and I said yes. In turn, I have been involved in three of his productions, received orders on other CDs and even got introduced on the Public Broadcasting System. Not bad for donating a couple of tracks. In the end, you have to do what you feel is right. I think all everyone needs to give back at one point in their life. It’s too short, share what you have when it is right – it will be appreciated. 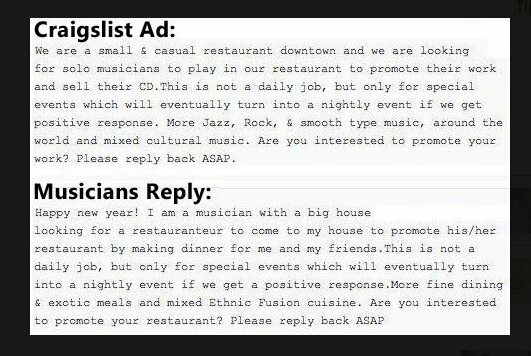 There was an ad on Craigslist from a restaurant looking for bands to gain experience by, basically, playing there for free. A musician saw this and thought how it might feel if he turned it around on the restaurant. If this is true..it is pretty funny!